I think this year VD is going to be particularly low-key for us at Vegan Cookie Fairy HQ; we’ve got a lot on our plates and are pretty exhausted. Each day when I wake up, I don’t know if it’s going to be a high or a low, I just know that I have to muster up the strength to make the best of it. This grown-up thing doesn’t seem to get any easier with age. (Says the 22-year-old, I know. I don’t have the gift of hindsight and wisdom just yet, unfortunately.) Neither does love, really. When I was younger (again, I see the irony of that statement) I used to think love was agreeing on everything, having tons of interests in common, wanting to do the same things in life and never having arguments, having a kind of endless, boundless source of energy to devote yourself to your ‘other half’; in short, perfection. Something to make every else envious. Now I think love is more simply defined by the ability to compromise, to say you’re sorry and mean it, to accept what can’t be changed and choose whether you can live with it or not, to make his favourite dishes often enough that he’ll eat my rabbit food, to get shouty when I need to release some steam but learn to compose myself before I overstep the line. I used to think love was living for someone else; and when I did, I lost myself totally. Now the tricky part for me is to let someone in without giving them all of me, and keeping enough of me to myself without pushing other people away. It’s a hard balance to strike. Some days I get completely frazzled trying to walk that line, and I might fall off and just sort of roll around on the floor feeling like a total failure for a while. That’s ok, I’ve realised. It feels like crap but it’s ok, it’s normal. Not a whole lot of things make me feel better when that happens, but baking usually helps. Knowing that if I melt chocolate and coconut cream in a pan, I’ll get a divine ganache, every time, is comforting to a control freak like me; the dough gave me more trouble, but I’ve cracked it now. The trick was to bake it longer, be more patient. It paid off in the end. Another thing that helps is writing; and even better, when my writing gets published. I recently wrote a short story about a girl struggling to find her feet in difficult times, and there’s a recipe to go along with it. You can read it now on Food & Fiction. re-heat the oven to 180ºC (350ºF). Grease a pie tin (9.5 inches diameter). Mix the chia seeds and water in a small cup. Set aside. Rub the flour, sugar and spread together between your fingers until they begin to form a mixture like wet sand. Add the chia seed mix (the chia “egg”) and mix again until homogenous. Roll the dough into a ball, then flatten to a disk using a rolling pin. It’s alright if the edges crack a little bit, you can patch this up as you go along. The flattened dough should be about half an inch thick and circular. Drape the dough over the greased pie tin, then tuck it in along the edges and bottom. Tidy up the presentation now: trim the dough along the rim of the pie and discard any excess. Prick the base of the pie dough with a fork. Cover the base with a sheet of parchment paper, cut into a circle the size of the pie, and fill the bottom of the pie with baking beans. Bake for 45-50 minutes. Cool on a wire rack. Place both ingredients for the chocolate filling in a medium-sized saucepan over low heat. When the cream starts to melt and the chocolate oozes into it, stir gently with a wooden spoon to combine. After a few minutes the chocolate and coconut cream should have melted into a silky, thick cream. 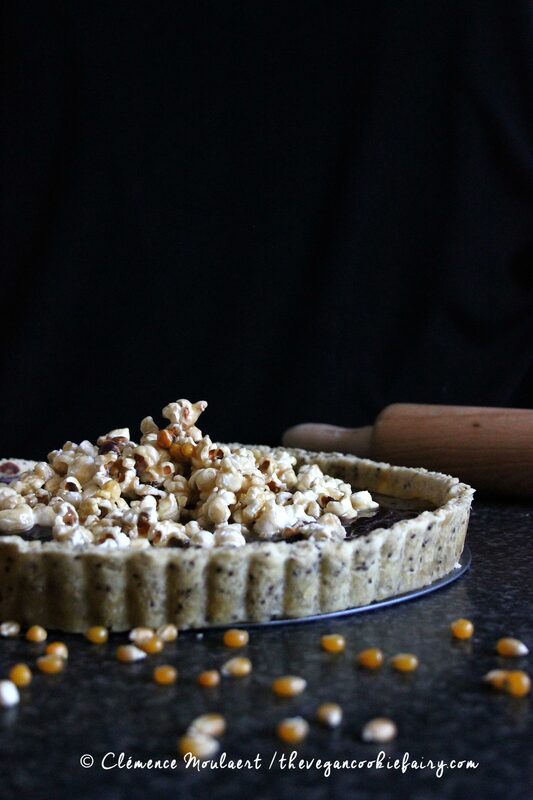 Set aside to cool while you prepare the caramel and popcorn. Now prepare the caramel and popcorn topping. Add the sugar and coconut milk to a medium-sized saucepan and bring to the boil. Pay close attention, as you do not want this to boil over. As soon as the cream starts to bubble up fiercely, turn down the heat to moderate and leave to simmer for 20-30 minutes, or until the liquid is reduced by half. Add the salt in the last five minutes. While it’s hot, the salted caramel will look quite liquid still, but as soon as it cools down it will thicken up substantially. Place a pan over high heat, drizzle in some oil and add the popping corn. Cover with a lid and wait a few minutes until the corn starts to pop. When the popping noise has stopped, all the corn is ready; take the pan off the heat and leave to cool for a few minutes. If you remove the lid immediately, you may get some popcorn firing at you. 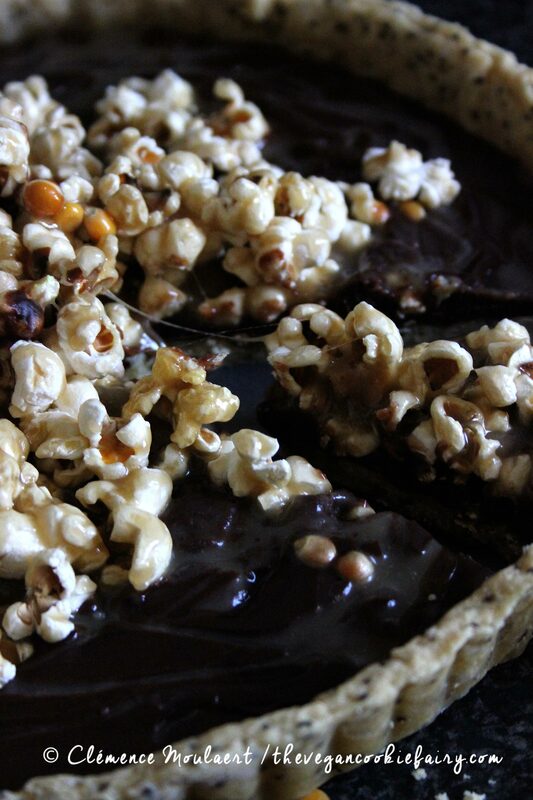 While the caramel and popcorn cool, release the pie crust from the tin and pour in the chocolate filling. 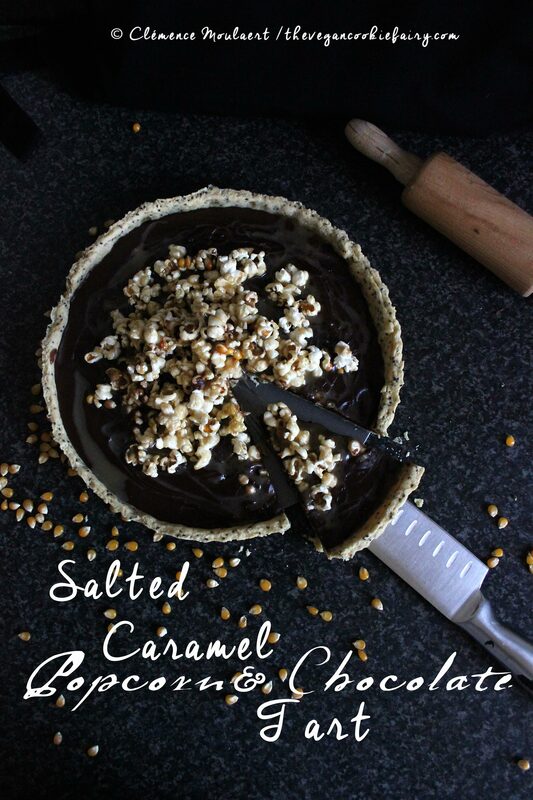 Mix a third of the salted caramel into the popcorn, coating it all evenly. Drizzle another third over the chocolate filling, then top the pie with the popcorn, creating a little pyramid, and finally drizzle the remaining caramel sauce over the whole thing. Place in the fridge to set, for about an hour or two. Enjoy within two days. If you have made sure to cover the popcorn with plenty of caramel, it should remain fairly crunchy. 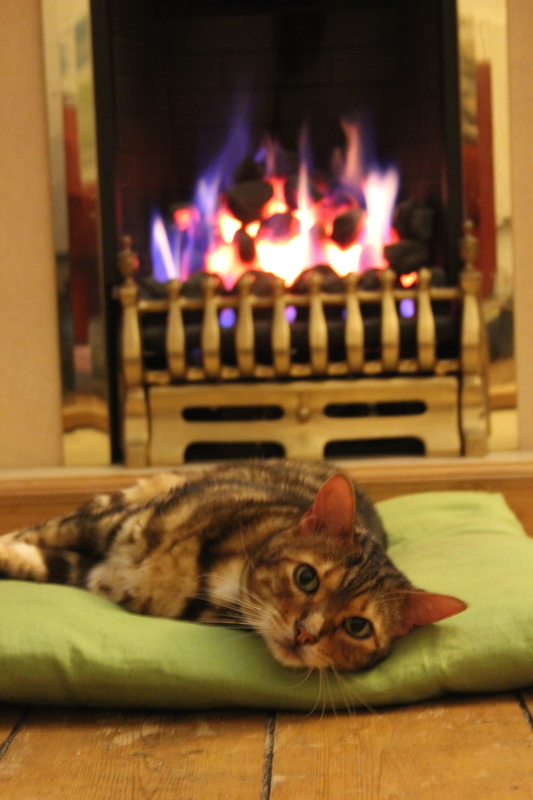 So yummy, you are my star and I love you and love that cat too …. Yeah I don’t tend to make a big deal of Valentine’s day ever but I do look forward to making a special dessert for the occasion! The popcorn looks amazing! I just read your fiction story too and I was really impressed, you are definitely multi-talented, lucky you! Thanks June 🙂 Hopefully there will be more short stories in the future!